Pete Hawkins trained as a geography teacher and taught in schools for a year before escaping to the Peak National Park’s Environmental Centre for an outdoor job. As a navigation instructor he has taught both beginners how to read a map and compass and the more experienced how to hone their navigation skills. He runs the Silva-sponsored Silva Navigation School from his Peak District home. 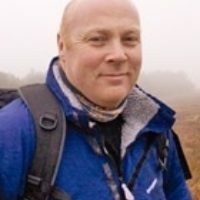 He has written for a variety of outdoor magazines, has worked for the BBC as a local radio reporter and leads walking holidays both at home and around the world.